One of the truly delightful things about now living in Paris for an extended period is getting to explore many of this city's delights that are often out of reach when you are here as a tourist for just a few days. 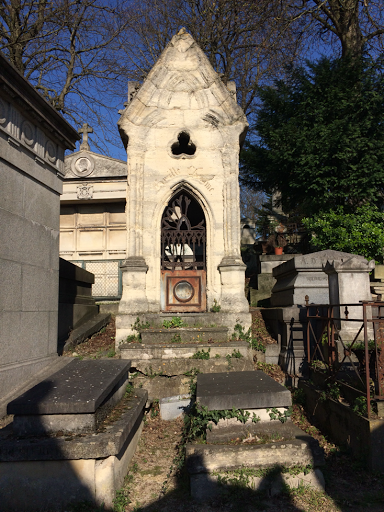 Touring the Pére Lachaise cemetery on the outskirts of Paris is one of these wonderful activities. 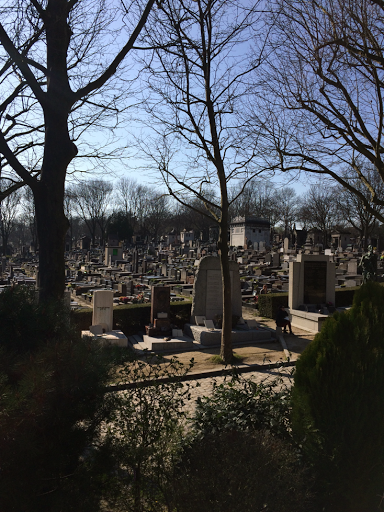 Located in the 20th arrondisement, the cemetary was a 45 minute bus ride from The American Church in Paris. We did take the metro(underground) on the way back and it was much quicker but the bus ride took us through cool neighborhoods so it was just fine with us. 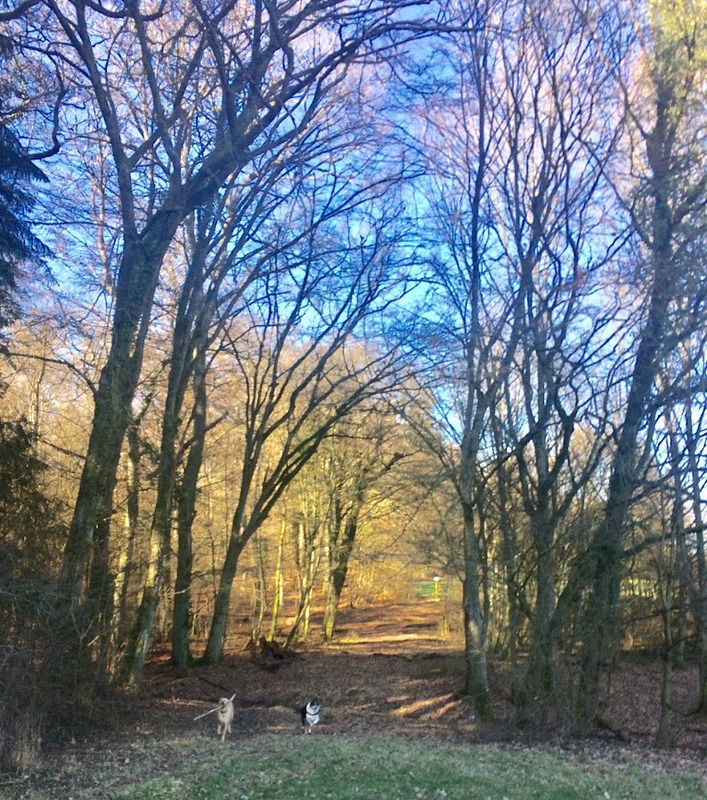 It was also 18C(almost 70F) outside, the sun was shining and it felt like a summer day! 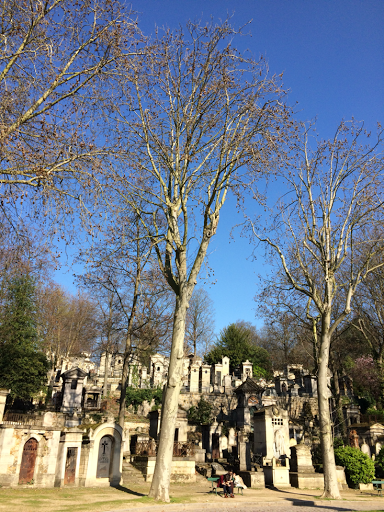 The cemetery is a very cool place with flamboyant and impressive gravestones along with many famous dead people buried underground. 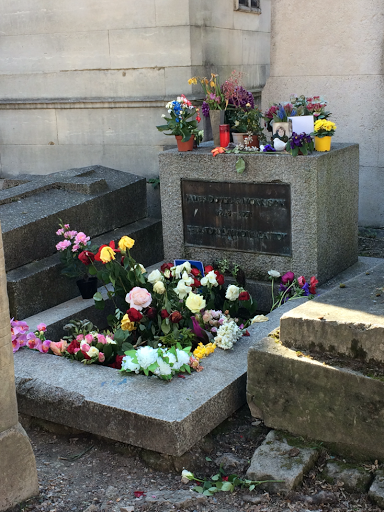 The most famous American to be put to rest there is Jim Morrison. His grave has been damaged many times so now sits behind a chain link fence. A bust of him used to adorn the grave, but alas, was also stolen so now it's a rather non-descript grave site. 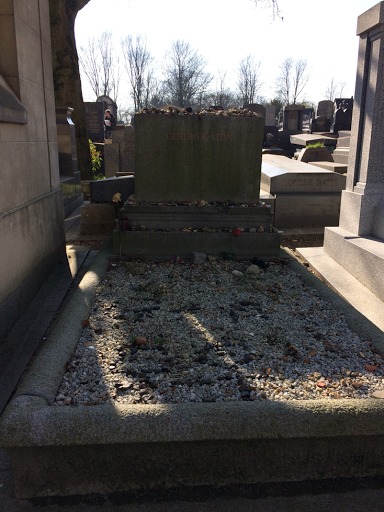 Other famous graves include Gertrude Stein, which was interesting since I'm currently reading The Paris Wife, a memoir written by Ernest Hemingway's first wife, Hadley Richardson and Stein figures prominently in their journey while living in Paris. Her grave is understated. 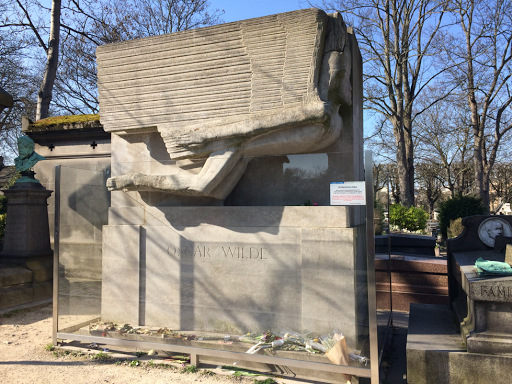 Not surprisingly, the grave of Oscar Wilde is a bit more pronounced with a lovely quote about being mourned by outcast men serving as poignant reminder of all that Wilde suffered in his life. It is ensconced in glass and many still kiss the glass as a sign of affection and connection. Apparently people used to kiss the grave itself and it was causing more damage than was helpful. 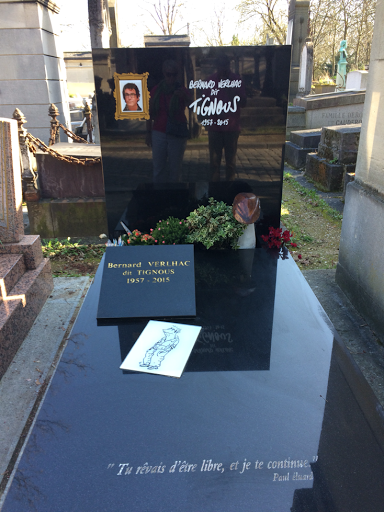 Other notables include Moliére and Edith Piaf along with Bernhard Verlhac, a name unknown by most, but upon discovering that he was French cartoonist who drew for the satirist magazine, Charlie Hebdo, it doesn't take long to realize that he was on the 12 killed by terrorists back in January of 2015. 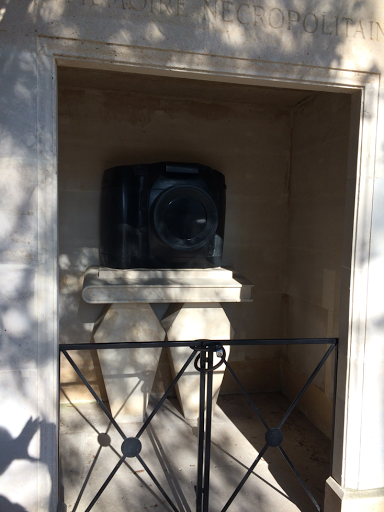 There is always a cartoon on the grave and many notes that state, "Je Suis Charlie." Interesting enough, Chopin, the great Polish composer is buried here after coming to Paris at the tender age of 21 and never leaving. 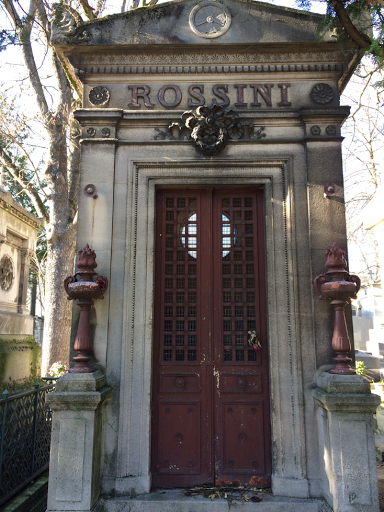 The last grave we spotted was that of Gioacchino Rossini, the man who wrote the William Tell Overture. There are many, many more graves to see. Many non-famous people often used their grave marker as symbol of their profession. This camera reminds me of my talented cousin, the photographer. 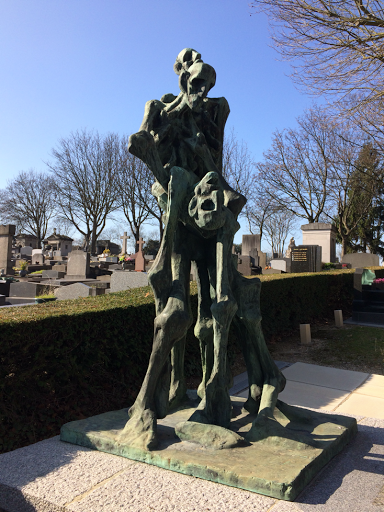 Perhaps the most fitting grave marker for artists is a symbol of their craft. The place is huge, 100 acres and you could wander for days. People are still buried here as was evidenced by a couple of interments we witnessed. it costs €11,000! 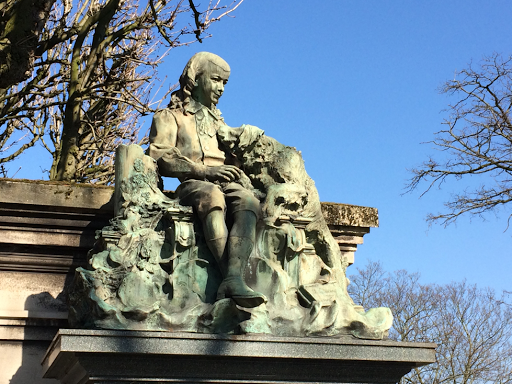 Of course, I could not resist this adorable, yet poignant grave marker of a child and his dog. The child buried here was indeed only 9 years old. 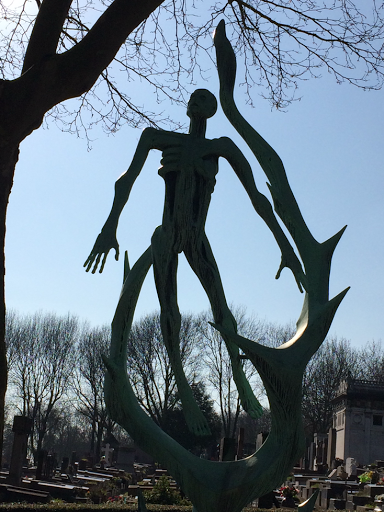 One of the most moving aspects of our wander were the numerous memorials devoted to victims of WWII. 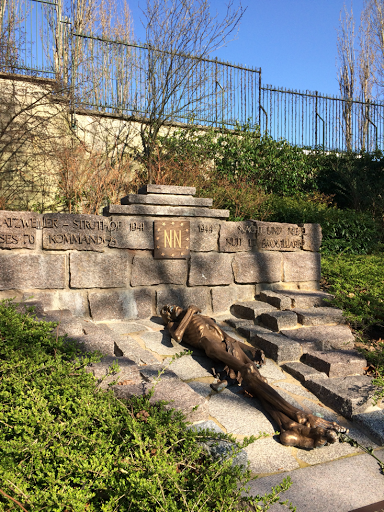 Always when on the continent and I encounter a memorial to WWI or WWII, it brings it much closer to home since I am often standing on the soil where the lives were lost. 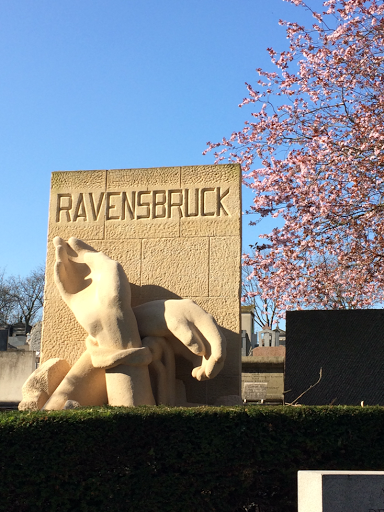 Every small village in Europe has a memorial or two to these world wars and the sheer number of memorials that stand in this cemetary alone is powerful. 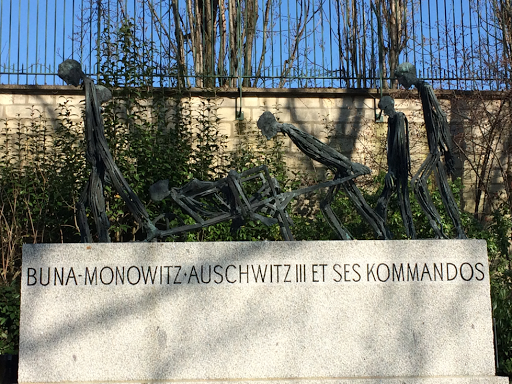 Most of the memorials were dedicated to the lives lost in the concentration camps. The names of Auschwitz, Dachau, Ravensbruck, Buchenwald, to simply name a few are powerful reminders of the pain suffered at the hand of the Nazis by so many people in so many places. The memorials are graced with powerful pieces of art, sayings, and names. I was amazed to see how they went on and on. On a more whimsical note, many people, not in the least bit famous, have beautiful graves and the artistry of the cemetery is well worth the wander in and of itself. I loved our warm and beautiful afternoon here. I thought a lot about these prominent people in history who are now gone, only remembered by their graves and of course, their work that lingers. But death is death and when life ends, well, it's the ground that awaits our earthly shell, no matter the legacy we've left. I pondered why seeing someone's grave is such an interesting thing to do. And I guess it's rooted in the fact that when you know something of someone's life, seeing where they were buried somehow gives credence to the life that they led on earth. But it's really the living that we do that we are remembered for, not the dying. 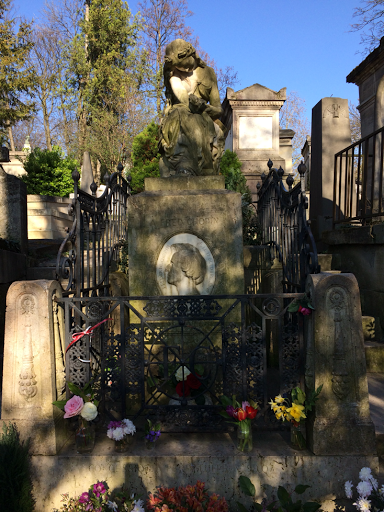 It's interesting to know where Chopin is buried and see his beautiful grave and see how people come to pay homage, but listening to his compositions is more interesting and life-giving, that's for sure. Cemetery's are the great equalizers. All are equal in death. A grave plot, a grave stone and some words...that's what often marks our death. It's what we were about while living that truly matters. It has inspired to me to live well for after I die, that's what people will be interested in. No composer nor writer nor artist has ever been given the chance to return after death to write a story or a song or to paint a picture. It's only what we accomplished while living that inspires people to visit where we eventually died. So live well...be inspired by those whose life is now over but whose legacy in words, song, and art live on for us to enjoy and to ponder.